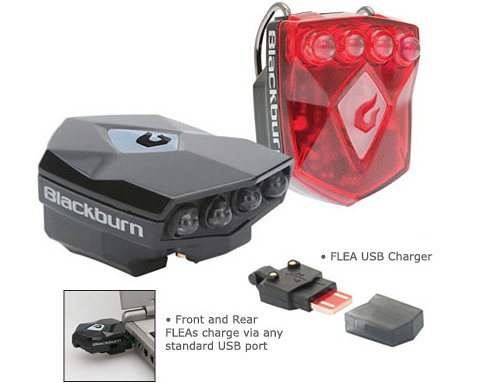 Blackburn FLEA Rechargeable Bike Lights | OhGizmo! They might not be the best accessory for really long bike trips, but if you only cycle to get to work or around the city, Blackburn’s FLEA bike lights will save you from ever having to replace batteries again. They come with a small USB dongle that attaches to any standard USB port, and once again thanks to the power of magnets you simply need to dock either the front or back light to charge them up. On a single charge the front light, which spits out 40 lumens thanks to a set of 4 super-bright white LEDs, will run for 3 hours steady, or up to 5 hours flashing. While the back light with its 4 super-bright red LEDs will keep on keeping on for 6 hours steady and up to 12 hours flashing. In addition, an extra set of LEDs hidden under the logo on top of the lights will glow green, orange or red indicating their current charge level. ~$30 for the front and rear lights, sold separately. The power of USB is awesome and can be used with anything.